*This is an unedited and unoffical print version of R.J. Rushdoony’s lecture. 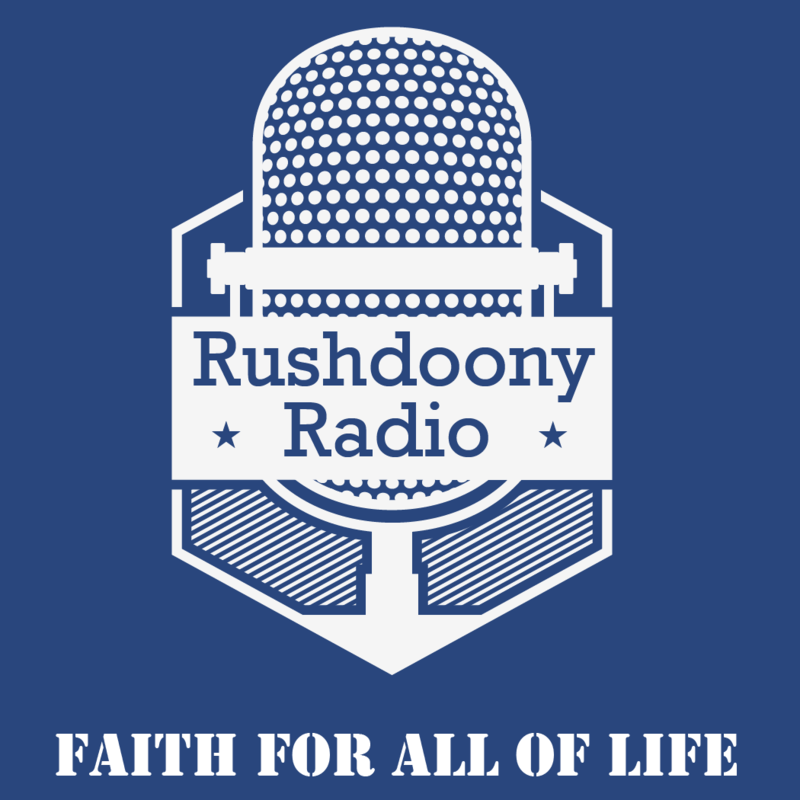 R.J. Rushdoony: 00:00 If you want to hear more of the good simple woman of our countries say has been done onto their sons. When the lads have set their lives elsewhere and their mother cannot wean them from it. It is certain that when fathers and mothers be dead and step fathers and step mothers, argue with her stepsons and scold them and repulse them, and take no thought for their sleeping nor for other food and drink, their hose in their shirts, and all there other needs and affairs. And the same children find elsewhere a good home, and good counsel from some other woman who receives them and takes thought to warm them with [inaudible 00:00:45] with her. And to give them a bed and keep them tidy. Mending their hose glitches, shirts and other garments, then those lads cling to her and desire to be with her. And to sleep warm between her breasts, and are all together estranged from their mothers and fathers who before took no heat of them. And now want to get them back and have them again. R.J. Rushdoony: 01:08 But it may not be, for these children hold more dear that company of strangers and care for them than that other kin folk who have no care for them. Then the parents will mount and weep, and say to the same women have bewitched their children. That they are spellbound and cannot leave, but are never easy save when they are with their enchantress. But whatever maybe said of it, it is no witchcraft, but it is by reason of the love, the care, the intimacies, joys and pleasures which these women do in all ways onto the lads, and on my soul there is no other enchantment. Wherefore, dear sister, I pray you thus to bewitch and bewitch again your next husband. And beware of dripping rope and smoking fire, and scold him not, but be unto him gentle, and amiable, and peaceable. R.J. Rushdoony: 02:08 Be careful that in winter he has good fire without smoke and let him rest well, and be well covered between your breasts and thus bewitch him. And thus you shall preserve and guard him from all discomforts and give him all the ease that you can, and serve him and cause him to be well served in your house. And you shall look to him for outside things. Or if he be a good man, he will take even more care and trouble over them than you wish. And by doing all that I have said, you will make him always miss you and have his heart with you, and with your loving service and will shun all our houses, all other women, all other services and households. All will be knobs to him save you alone, if you think of him afore said. And so on the road husbands with think of their wives, and no trouble will be a burden to them for the hope and love they will have their wives. R.J. Rushdoony: 03:09 Whom they will long to see even as poor hermits penitence and fasting monks long to see the face of Jesus Christ. And husbands last served will never desire to abide elsewhere, or another company, but will withhold, withdrawn, abstain themselves therefrom. All the rest will seem to them, but I’ve bed stones paired with their homes. R.J. Rushdoony: 03:39 I think that’s very interesting and very revealing as to the practicality and the simple Christian outlook of the people of that time. There’s nothing romantic about that. It’s down to earth, preparing a wife for her second husband. He was totally delighted with her, but he wanted and it was his joy and pride in life to prepare her properly for a good young man who had married her in a few years when he died. And he didn’t want her to wait a long time as a widow. Get married as quickly as you can, but to the right man. Well, we don’t know what happened, but we have a pretty good guess, because she kept the letter is apparently, and prized, them and pass them on in her family. So obviously it all worked out and it is a very interesting aspect of the period. R.J. Rushdoony: 04:52 It makes clear the difference between their era and ours. But, within a century or two, that note disappeared. Why? Because romanticism came in, and the idea of romantic love. And this of course made the kind of common sense attitudes that this man represented hopelessly out of date. Romantic love thrives on frustration. It likes to feel sorry for itself, and the essence of romantic love is that there be insuperable problems, star-crossed lovers. And that it go from frustration to frustration, and romantic love dies when it can get the one it loves. Whereas the kind of thing this Frenchman represented thrives rather with realization. R.J. Rushdoony: 06:03 The great classic of the era that developed before too long, the great classic of romantic love was Kristen [inaudible 00:06:13]. And of course it set the tempo for romantic love, which to this day has lingered. Someone falling in love with another person’s wife, and going from complication to complication, into adultery, into frustration, tragedy and death. The whole of the romantic agony. The idea of living happily ever after is alien to romantic love. Whereas this husband and his young wife, the ideal that was represented was of living very happily together, and the wife living happily ever after when he was gone. And making provision for that, so that what he represented in his letters to his wife was a genuinely Christian perspective. R.J. Rushdoony: 07:11 In an unusual situation, one we’re not familiar with, but all the more revealing because it was such an unusual situation. A man over 60, a girl of 15 being prepared by her husband’s letters, being trained for another husband. It hardly is the normal thing today, but it certainly was a godly thing. So the medieval period, we must say, in spite of all it’s sin, had a great deal in it was remarkably Christian. And I cite in this chapter cases where well into the late Middle Ages in England, I found an instance where the congregation of a church laid down the law to the priests. That say he was going to stop quoting classical poetry and classical authors in the sermons, and give them nothing but the Bible. There was a lot of that throughout the Middle Ages. And we forget that a lot of the people did have the Bible. R.J. Rushdoony: 08:24 In England, for example, Wycliffe had translated the Bible into English, and the laws existed right down to the reformation. Going around adding secret meetings, Bible study groups so that there was in England when the reformation came about, a tremendous body of people who just surfaced who’d right along and studying their Bible and knew it. So that by the grace of God, the word of God itself remained always before the people, even in the darkest era of people power and royal tyranny. Thus the medieval period, a very interesting, a very exciting period, a period which had a great deal of usefulness and vitality to it, a freshness about it, as well as a great deal that we must clearly regard as heretical is a period of great interest. R.J. Rushdoony: 09:45 I think one thing sums up, and this is from a Catholic historian, what happened. As gradually the theology that came out of Rome departed more and more from the faith as well as their moral practice. The pictures that show us worshipers in the early medieval period are very revealing. They show people praying with her hands open expectantly, the attitude of receiving, and their faces turned upward joyfully towards heaven. Towards the end of the Middle Ages, the prior show people with their hands like this folded, cowering in prayer, afraid, because they did not have a saving knowledge. They were overwhelmed by the burden of their sin and guilt, and they had no preaching of the word. And so an era that began with a sense of joy and of light, and when you read Chaucer’s Canterbury Tales, you can feel the freshness of spring throughout. It’s a joyful thing. R.J. Rushdoony: 11:04 Closed with a grim note of darkness and the reformation came to light in that darkness, let us close with prayer. Almighty God, Our heavenly father, we thank thee that throughout the ages, thy witness has always been present among me. They word, they truth [inaudible 00:11:30]. We thank thee for the saint of old, who en humble well in great ways. Set forth they truth, were faithful unto the they are calling, and rejoice in they sovereign salvation. Make us faithful in our age that we may witness and a good witness, and in they name conquer. In Jesus’ name. Amen. R.J. Rushdoony: 12:05 Are there any questions now concerning our lesson? Let me say before we do that next week we will have the 15th chapter on the reformation, so please read to that for next week. And to remind you that Sunday in Westwood, before our meeting from 9:30 to 10:45, we will hear a very outstanding recording of Handel’s Messiah. Now, are there any questions? R.J. Rushdoony: 12:55 Oh, there are a number of books. The book I was reading from this time, it’s Monks and Civilizations. I don’t recall which ones I cited. There are so many here. There are some very interesting things on the Irish monks. I don’t recall now which ones I cited, unfortunately. Yes. Any other? Yes. Audience: 13:37 This is really taking long. I would like to know what [inaudible 00:13:45]. Audience: 13:55 Would you repeat the question? R.J. Rushdoony: 13:57 The question was to differentiate between the philosophy of Aristotle, Aristotelianism, Plato and Platonism and Neo-Platonism. Now they all come out of Greek philosophy. Greek philosophy held that it was dialectical. Now dialecticism says that there are two ultimate’s, which are basically opposite to one another. And it tries to affirm both of them. It’s like saying you worship both God and Satan, you see. That would be a dialectical position. You regard them both aS equally ultimate. Now for Greek dialectical thought, the two ultimate’s where spirit and matter, which they saw as two different things, totally. Both of them equally, ultimately. In other words, having a position like God, being ultimate, not created, but both always there. Now, how are you going to unite these two? How are you going to have any contact between the one world and the other? Now, Aristotle tried to bring the two together and say you had to maintain the two in a dialectical tension. You couldn’t surrender the one or the other. And he tended to emphasize the unity, bringing them together, and the state as the basic agency in society, the saving order, because man was for him essentially a political or a rational animal. The state was the idea or form, or mind, or spirit in the world, and people and the natural world were in a sense the matter of the state. So he was bringing form and matter together and the unity of the state. Now, Plato of course, also unified things in the state. Plato’s republic, a communist order. But Plato tended to emphasize ideas or the realm of the mind and the spirit somewhat more than matter. R.J. Rushdoony: 16:21 And with the Neo-Platonist, this ended up by saying the world of matter of the world of the state, the world of the flesh was nothing. And the Neo-Platonists therefore tended to disregard anything that was of the flesh. So they became ascetics. They would go onto the desert, they would torment the body. You read about some of the early hermits in the church who went through all such things, before they came around, the pagan Neo-Platonist monks and hermits were doing this. And these were simply converted and carried over some of this Neo-Platonism into their thinking. So you have this dialecticism of form and matter, or mind and a matter in all Greek thinking. But progressively from Aristotle, to Plato, to Neo-Platonism, the emphasis is less and less on the unity, and more and more on the spirit, or on mind so that the world of matter becomes less and less important. Does that help explain it? Any other questions? Audience: 17:43 [inaudible 00:17:43][crosstalk 00:17:43]. R.J. Rushdoony: 17:42 Oh yes, there were two kinds of university. Some were students who would get together to study and would call someone to teach them. Others were scholars who had come together and form the school and then they would in a sense advertise themselves to bring the scholars. However, they had one system which was very interesting. You could be on the faculty, but your income depended on the number of students you had. You see. So that if the students didn’t feel you had anything to teach, they wouldn’t go to you, and a very successful teacher would have quite a sizeable income. However, most of them were members of various monastic orders so they would give it to the order. R.J. Rushdoony: 19:08 But a professor had an income in terms of his popularity. And something of this, it isn’t a perfect system. Something of this wouldn’t be out of a line today, because there are many universities where they will have a man getting $20, 000 a year to teach some out of the way subject, where he may have one or two students. And this with taxpayers funds. Yes. Audience: 19:55 Were the monasteries series part of the Catholic church [inaudible 00:19:55]? R.J. Rushdoony: 19:55 Well first, the monasteries and the priests were separate. The priests were attached to churches, congregations. The monasteries are made up of people who came together to serve God in a community. And they would be scholars, they would be farmers, they would be evangelists traveling from here to there preaching. They would do a variety of things. They lived in community, whereas the priest was a married man throughout most of the middle ages serving a parish. So, there was a very real difference between the two. Yes. Audience: 20:40 Were hospitals and charities [inaudible 00:20:44]? R.J. Rushdoony: 20:46 They were all carried on either by bishops are by the monasteries, the monks. They took care of all of these things. And of course you had various lay Christian groups, Christian businessman who would establish hospitals and schools, and so on, and endow it. That was the origin of foundations. Foundations were an origin entirely Christian. They were organizations for the promotion of various Christian causes by Christian businessman. Audience: 21:29 Where did the priests get their training in those days? R.J. Rushdoony: 21:35 Well, sometimes at a school, and sometimes by studying under someone, it depended on the area. You see, we must disabuse ourselves that there was one united church with one common form in every country. What was happening was that gradually Rome was trying to gain control, and finally did, and then lost everything with the reformation. But it would vary, sometimes, from one community to another. It would be wildly different from one country to another, and in the same country you might have a dozen different ways of carrying on the church life, and so on. In many cases, say a feudal lord would run a church absolutely, and he would name say a younger son of his to be the priest. Because he’d give the first one the lands and estates, and he would make the other sons priests. R.J. Rushdoony: 22:42 And sometimes he’d consecrate them as priests when they were eight, 10 years old, and make them bishops by the time, or before in some cases, they were in their teens. Because he controlled those churches and he wanted to have them there so that he could feed his sons into them. Now, this was the system of patronages by local lords, and it was fought by the bishops in some cases, and by Rome throughout the middle ages. They never overcame entirely. And it is interesting that in Rome they never overcame it either, but the day, the almost only orthodox congregations in the church of England are the patronage churches. Where a township or a Lord names the rector, and the archbishop of Canterbury can’t do a thing about it, and the bishop can’t do a thing about it. Well, now those are the only conservative or orthodox churches in England. Yes. Audience: 24:03 [inaudible 00:24:03] Roman Catholic [crosstalk 00:24:11]. R.J. Rushdoony: 24:12 Yes. Well, St. Augustine was a bishop, a bishop of Hippo in North Africa and he did not consider himself as under Rome, but as a partner with Rome. In other words, he was a bishop and the bishop of Rome was another bishop. This did not make the one lord over the other. That was the attitude. R.J. Rushdoony: 24:46 No. No. He did the live in Italy for a time, but he was from North Africa, and he served their finally, and while he was dying, the barbarians were taking the city where he had his bishopric. He was named by acclamation, which was the common way of naming a bishop in those days and many areas. This is another way. You see sometimes a lord would name them, but in many areas in the early church especially, and it gradually died out, it was by acclamation. That is, the people would simply demand that somebody be named bishop. And they would very often single out someone whom they regarded as a superior man, if the people were a superior faith. And they demanded Augustine, who didn’t want to be bishop, and he was made bishop. R.J. Rushdoony: 25:49 Well, now the origin of the bishop was this. In the Apostolic church, you see St. Paul and the other apostles going from place to place starting churches. Now, they will be the pastors of these churches, and they would write letters as Paul did to these churches. And they would name someone who they ordained, we would call them an elder to carry on the work there. Well, as time passed you see various men, who are successors of the apostles, would sometimes be, say, pastor in a city church, and then they would make a continual tour evangelizing in the countryside. And because they worked first in the cities in those days, the apostles went from city to city because the way the church began was to go to the Jewish synagogues and make their first conference their. And the Jews who were in the cities. R.J. Rushdoony: 26:56 In the countryside was pagan. And the word pagan means country person, a rural person. That’s its literal meaning in origin. So as they go from place to place, you see they would gradually not only have the church in town, where they were a part of the time, but they would have maybe five, 10, 20, 30, 40 little congregations meeting in homes. And they would name a layman, an elder, or a presbyter to take charge of these home study groups, these home churches. Now that’s how the bishopric developed. So you could call him a minister who had a number of elders. And in those days the elders exclusively, and this is what an elder is properly. Someone who’s carrying on work in a particular place. A meeting has been started and which the pastor visits regularly, and in between times the elder is carrying it on. R.J. Rushdoony: 28:09 So gradually as these developed into churches, the one was called bishop and the other the presbyter, or pastor. So in a sense, neither the presbyterian nor the episcopal method is entirely in terms of the original. They both are outgrowths of the early church practice and both have departed from it. Yes. R.J. Rushdoony: 28:56 Yes. Well, that’s what it meant then too. But you see, since they had conquered … were in the cities, when they would talk about working with those who had no witness to them, they are talking about the pagan. Pagans. The country people. There was no witness to them, so they were going out to the pagans. This was in the early centuries. Yes. Audience: 29:32 [inaudible 00:29:32] were all women educated by their husbands in those days? R.J. Rushdoony: 29:34 No. The women went to convent school very commonly. So, this girl of 15 you see could read. Her husband who was writing letters, which indicated she had education. It wasn’t education in our sense. That is education in reading, writing and arithmetic. It was education as to how to manage his estate, and how to find the right husband, and how to handle the second husband. R.J. Rushdoony: 30:23 No. I don’t think that’s fair to him, because he makes it clear he was delighted with her. But he’s also telling her and reviewing things over and over with her because he wants her to be able to be the perfect wife for her second husband, and to know exactly how to manage the estate and affairs, and then choose the right man. And not the feel, you see, after all he was an older man of some means and she would naturally defer to him. And she did from their wedding night as he says. Well, when she married, say in five or 10 years, some young fellow his age or her age, 20 or 25, or 30, at whatever age she remarried, just because they were of like age he didn’t want her to feel that, Well, I don’t have to do all those things that I did when I married a very wonderful older man who was very good to me, and gave me all of this. It does in a sense, you see, the shoe would be on her foot, so to speak, because she would be going to that second marriage with a great deal. Yes. Audience: 31:40 During this long period [inaudible 00:31:49]? R.J. Rushdoony: 32:08 Yes. That’s a very good question. How was property protected during the medieval period? Now, when you go over some centuries, let us say from the year 1000 to the year about 1500, 500 years of history and medieval history. It’s very easy to find eras of great unrest, of war, of looting and robbing. But what we have to say is, well, those things happened but didn’t they have also a great deal of peace in between? And we have to say yes. That’s a very interesting thing that assassinations are virtually unknown during the whole of the middle ages. A very remarkable thing, which indicates there was a fundamental sense of law. Now, this does not mean they weren’t sometimes very brutal to somebody who was a tyrant, and through legal means was being brought to justice. R.J. Rushdoony: 33:20 But the merchants did go around, sometimes they would have to travel in caravans as it were, in order to have safety. So that it was quite normal to wait in a city outside a gate, and for a whole procession to go together so that a robber wouldn’t waylay them. So taking precautions, they moved around safely. They move goods around, they move money from here to there, and they did it with fairly reasonable security. When you realized that they would move goods from China to England in those days, you realize that they had to have quite a bit of law and order. Yes. Audience: 34:17 Repeat the question. R.J. Rushdoony: 34:30 The question was, since education for woman was so specialized in that day, wouldn’t it be wise if it were so today? and I think, of course, the answer is an obvious yes. Women should be educated in terms of their life as a woman. It doesn’t mean that their education is any the less capable. In fact, a woman in terms of scripture is a competent manager, and an assistant in the management of her husband’s estate. And it would be much better if women today had more training in business administration and related subjects, the kind of mathematics that are related to that management of estate. Since so much of the wealth of the country is in the hands of widows today, and less of the nonsense they get. R.J. Rushdoony: 35:25 Because a woman doesn’t need geometry, and most men don’t either. Our Education today, a lot of it for men and woman, is nonsense. Any other questions? Well, now that our time is just about up, and there are no more chapters to give out. But if some of you did not get some of the back chapters, we have one or two available. For those of you who have paid and have failed to get them because you were not here, or absent.